As Californians increasingly build homes near forests and in wildland areas, the number of fires and their destructive force threaten to intensify. Many researchers and public officials want tighter rules on building in the WUI. For more than 25 years, reporters and fire managers have referred to the Oakland hills inferno of October 1991 as one of the most destructive in U.S. history in terms of property damage and lives lost. Called the Tunnel Fire, the firestorm killed 25 people and destroyed about 3,000 homes. But this month, drought, warming, and sprawl culminated in disastrous fires that set new benchmarks for destruction, killing more than 40 people and reducing more than 8,400 structures, mostly in Santa Rosa, to ashes. The North Bay fires also reignited ongoing conversations about the hazards of building homes in vegetated areas. Forest managers and fire experts often speak of the WUI. Pronounced whoo-ee, the acronym stands for "wildland-urban interface," a dangerous frontier between open space loaded with natural fuels and the millions of homes built nationwide at the edge of what could be referred to as "fire country." According to state fire officials, one-third of California's houses are located within the WUI — a figure that continues to grow as housing subdivisions sprawl into open space. And according to the research firm Headwaters Economics in Montana, about half the nation's homes built since 1991 are in WUI zones. Building houses in the WUI creates a compound hazard: It increases the chances of fires igniting and elevates the potential for loss of life and property. Bill Stewart, a UC Berkeley forestry expert, noted that developing in the WUI means more power lines in wooded areas. "And that can be an additional source of fires," he said. In the North Bay, officials are investigating whether the fires started when high winds knocked over power lines in wildland areas. But more problematic may be the way that homes built in wooded open space effectively absorb public resources for extinguishing wildfires. "Having more and more houses in the WUI diverts more firefighters' attention to protect the homes, and it takes away resources from reducing the total damage from the fire," Stewart explained. Often, he said, public infrastructure — like power lines and cell phone towers — are destroyed, and public trust resources — like watersheds and forests — are lost because firefighting policy is to protect private homes first. In essence, the general public — mainly people in urban areas — are subsidizing development of the WUI. California's landscape is naturally prone to burning, especially conifer forests, which historical tree ring data reveals burned roughly every decade, according to Andrew Latimer, an associate professor of fire ecology and plant biology at UC Davis. Such natural burn rhythms thin fuel loads, inhibiting the destructive, high-heat fires that make news headlines. Large fires, Latimer said, are mainly a product of modern times — thanks mostly to counterproductive fire suppression programs that have allowed branches, pine needles, and logs to accumulate dangerously, giving fires explosive potential. Ironically, such suppression efforts are often designed to protect homes from fires in the WUI. Latimer explained that the coastal oak woodlands — the ecosystem that dominates the East Bay hills and the North Bay wine country — do not naturally burn with anywhere near the frequency that Sierra Nevada forests do, mainly because lightning strikes are far less common in coastal areas than in the state's inland mountains. But because coastal oak woodlands naturally burn at longer intervals, Latimer said, the fires they generate tend to burn at higher temperatures and with greater ferocity. This, he said, makes areas like the hills of the East Bay and Sonoma and Napa counties particularly dangerous ones to develop. Stewart also said the flammability of the landscape is increasing. He said that under hotter, drier conditions, many relatively fire-resistant tree species are receding and being replaced by shrubby plants that are quicker to burn. "Shrubs are the most flammable vegetation we have in California, so a shift to shrublands does not portend well for us in Northern California," he said. While new housing developments in the WUI can create more ignition sources, global warming is intensifying the droughts that make forests so vulnerable to igniting. Authors of a study published recently in the Proceedings of the National Academy of Sciences found that anthropogenic climate change has doubled the area affected by wildfires in the western United States since the 1980s. As warming continues, the authors warn, fires will burn exponentially more acreage in the near future. Another study, published in 2016 in the journal Philosophical Transactions of the Royal Society B, found the average area burned by wildfire in the northwest United States each year from 2003 to 2012 was 50 times greater than during the period of 1972 to 1983. The authors of the research also observed that each year's fire season grew from an average of 23 days over the first period to 116 days over the second period. Building more homes in dense urban areas and fewer ones in the WUI is obviously one way to lessen the risk of destructive fires. And many researchers and public officials want tightened restrictions on building in the wildland-urban interface. 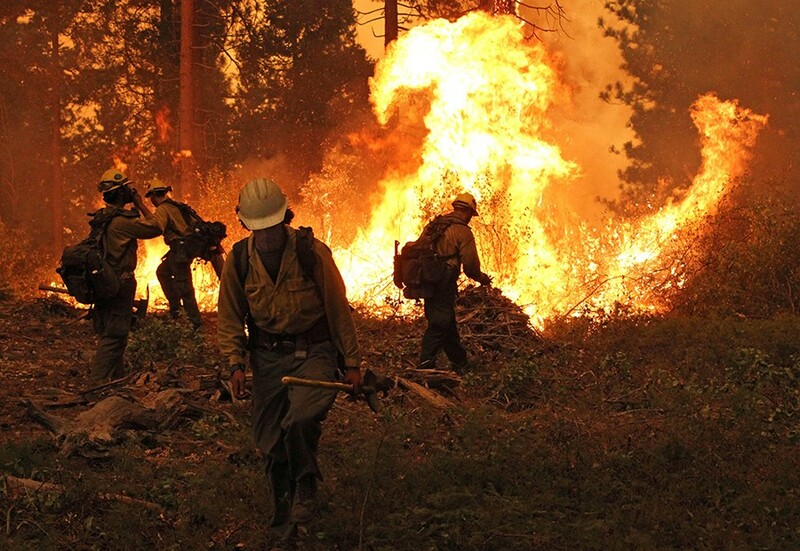 Linda Rudolph, director of the Center for Climate Change and Health at the Public Health Institute in Oakland, said she communities built in areas vulnerable to wildfire must include "adequate exit routes, with warning systems, and with building codes that require flame resistant building materials in fire-prone areas." Stewart said a requirement in some counties that rural multi-home developments include at least two roads in and out have stopped some projects in their tracks, mainly due to the costs of building and maintaining roads. The Golden Gate Audubon Society’s video cameras are focused directly on an osprey nest atop the Whirley Crane in Richmond, and the response has been overwhelming. Environmentalists say the decision by state regulators to hike the "fee" that residents must pay in order to go green undermines community choice agencies, like EBCE. People mistakenly try to recycle them, thereby contaminating the waste stream. Plus, they're not really compostable.